You have a beautiful trail in front of you, upbeat music blasting from your headphones, enjoying your run no matter the distance or intensity, and then it happens. A pesky cramp comes out of nowhere and takes your breath away. Almost every runner has experienced cramping, so let’s start by taking a look at the oh-so-common side cramps, and how to better prevent them in the future! What Causes That “Side Stitch”? A very common “cramping” sensation occurs in the side or stomach, and is often called a “stitch” – otherwise known as exercise-related transient abdominal pain (ETAP). It is described as a sharp, stabbing pain and normally hits just below the ribs. Surprisingly, the exact cause of side stitches has yet to be proven, but thankfully a few popular theories have been presented. Sports-medicine physician Jordan Metzl, M.D., explains that it may be caused by a spasm in your diaphragm muscle, which extends across the bottom of your rib cage and plays an imperative role in breathing. Like any other muscle, when your diaphragm is over-worked it can lead to fatigue and cramping. That’s why side stitches tend to strike beginner runners or those who are stepping up the pace or distance. Other possible explanations for provoking a pesky side stitch include nervousness, improper breathing, posture problems, starting off too quickly, weak abdominal muscles, a full stomach, or even the wrong running style. Although a side stitch is basically harmless, it can be painful! They often force the runner to slow down, lose pace, and maybe even quit a race due to the relentless discomfort. Fortunately there are quite a few precautions to take to ensure that you are stitch free. Start by eating a lightweight breakfast 2-3 hours before the start of your run. Be sure to warm up, not only to take care of your muscles, but also to promote ideal breathing. Begin slowly and increase your speed, a side stitch is a signal that your body is stressed or overwhelmed, so ease into it. Also be sure to strengthen your core outside of your running routine. Research has found that well-trained oblique muscles help to prevent a side stitch, and even 10 minutes of daily abdominal training can make a difference! So, maybe you took certain precautions, but the stitch still makes an aggressive appearance.If you experience an acute side stitch, remember to BREATHE! Proper breathing can contribute to relaxation of the diaphragm and respiratory muscles. Keep a pace for you breath, and try taking deep breaths into your abdomen, also known as belly breathing. Other options for dealing with the side stitch include slowing down your pace and giving your body time to adjust, and stopping for a minute to stretch before continuing on your run. Need some motivating news after all this stitch talk? Then you’re in luck! Thankfully, running is the best way to prevent a side stitch. After all, the better your endurance, the less often a side stitch will occur. This is because while running, you train your diaphragm and your respiratory muscles so they are better prepared for the stress that future runs have on your body. So don’t let the stitch hold you back! 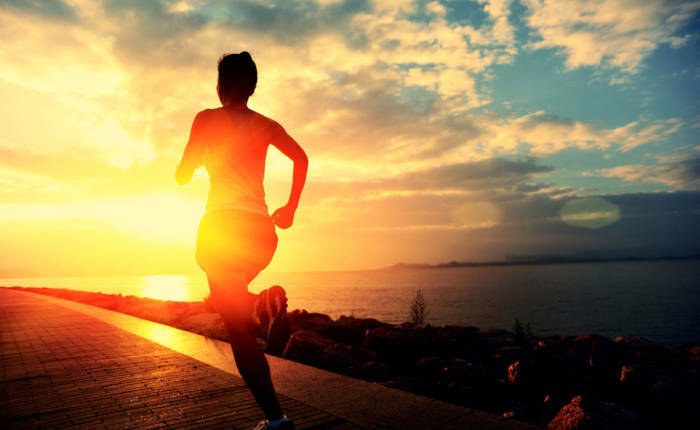 Be prepared and listen to your body, and most importantly – keep on running! Got Questions? SOL Performance trainers are here to help – we’re athletes who love helping active individuals of all ages feel stronger and perform better! Call us or sign-up online today for an intro 1-on-1 training session!